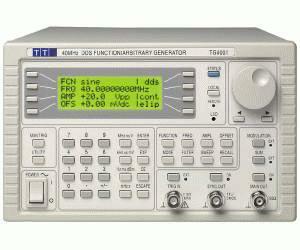 at up to 50MHz. The output amplifier has a bandwidth approaching 100MHz ensuring that waveform quality is excellent right up to the frequency limits. Amplitude flatness is better than ±0.2dB to 1MHz and ±0.4db to 40MHz. Low noise design ensures minimum waveform aberations and provides high waveform quality even at minimum output amplitude. Powerful mathematical functions are combined with on-screen drawing tools and clipboard functions to enable virtually any waveform to be created either from scratch, or from the editing of existing waveforms. Waveforms can be viewed with variable zoom and printed with annotation.